You look for a cardio machine which offers effective training and comfort? Then the upright bike Giro P of Kettler is the right choice for you. The frame construction that can be loaded up to a user weight of 130 kg offers safety and durability. A balance mass of eight kg ensures a comfortable training and a concentric run. The electronically adjustable magnetic brake completes the friction-free pedalling. You decide how you work out. Adapt the intensity of your training depending on your current fitness level using eight training programmes and 16 resistance levels - for a lot of motivation. Use the LCD display and read directly the training results and set new targets for the next workout. Pulse is measured via the hand sensors on the handles or an optional earclip. For best measuring, the cardio pulse set with chest strap is recommended. The computer gives a warning signal, when you leave the pulse limit. You wish to improve your fitness in front of a tv or a window? According to your needs, you decide the place of training by means of integrated transport wheels and the height levelling. Una bicicleta estàtica perfecta para realizar el ejercicio de cardio que yo necesitaba. Easy to install . Easy to use . Had problems with electrical wires with the first delivery though. Second time lucky. Service was good. 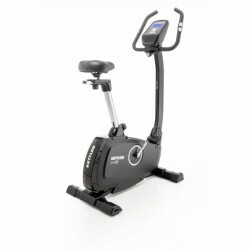 Kettler upright bike Giro P Black add to comparison list.